As our world ends, their nightmare begins. When the world doesn’t end this year (spoiler alert! ), fret not--it surely won’t be the end of the world for apocalyptic flicks. These things have been more common than false rapture alarms, and so enters The Collapsed into this fray. A threadbare take on the end-of-days, it’s another shoe-string indie that manages to keep its laces tied so it doesn’t trip over itself too much. Director and co-writer Justin McConnell keeps things lo-fi by focusing on a family of four who find themselves caught in a wasteland. Patriarch Scott (John Fantasia) leads the Weaver family through this wasteland, where they can trust no-one as they stay on the move, constantly avoiding whatever threat sent them on the run in the first place. Danger lurks not only in that form, but also in that of their fellow survivors since it's presumably become a dog-eat-dog world where supplies are short. As The Collapsed continues to unfold, you’ll be tempted to think that not a whole lot happens--sure, there’s action in the sense that people physically move from one place to another, but, with the exception of a minor shock early on, there’s a paucity in actual developments, at least on a narrative level. The movie just sort of deteriorates into the characters poking around and stumbling into different set-pieces. Discovering cold beer in a camper serves as a minor victory, while the need for less-ragged shoes represents the biggest conflict. At times, it actually feels like a typical indie family drama masquerading as a horror film, as Scott and his son (Steve Vieira) attempt to smooth over their past difficulties--which is exactly what you want to do as the world crumbles around you, I guess. The exact nature of just what is going on is concealed--not just up front, but for nearly the entire film. McConnell does a nice job of economically conveying just how far-gone the world is; unlike a lot of films of this ilk, The Collapsed doesn’t over-exert itself in the way of on-screen visuals. Since McConnell uses the sparseness to his advantage by featuring smoky, eerily empty streets and keeping his actual menace off-screen, hidden off and growling out in the woods that constantly surround the leads. Such an approach also results in motivations being opaque, so we’re really not exactly sure why this family is being terrorized by strangers with high-powered rifles, who are there seemingly to fill-out the requisite post-apocalyptic men in gas-masks quotient. Because of all this, most of the suspense in The Collapsed stems from whether or not it’ll all pay off in some way. I can see it as being frustrating for some (it was somewhat for me) since it sort of hovers aimlessly before slam-banging into a climax that dumps exposition and gore in equal measure. Everything is illuminated with a neat little twist that’s actually well-earned and surprising, so it manages to bail out The Collapsed. Complete redemption isn’t gleaned, but it turns out that McConnell’s yarn is spun around one cool idea, a notion that really works on paper but fails to leap to the screen since none of the performances really resonate. The inexperienced cast is adequate, but none manage to bring the necessary amount of emotional heft required to deliver the full force of its gut punch. Combine this with the de-saturated and dull photography, and The Collapsed fails to truly separate itself outside of the surprise itself, which ends up being a bit of an empty shock. As such, you may also be tempted to consider that The Collapsed might fare better as a short; however, I won’t go that far since the 80 minute run-time stretches things out just enough to lull you into a sense of expectancy, and McConnell deftly manipulates you into looking one direction and making some assumptions before pulling the rug. 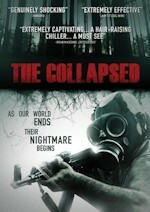 The Collapsed has toured a bunch of festivals, and now Anchor Bay is bringing it to DVD, where its presentation is fine. Visually, the film’s digital photography isn’t striking, so the anamorphic transfer is largely unimpressive but adequate enough (with the exception of a little bit of crushed blacks), while the 5.1 surround track is more dynamic than you might expect given the largely quiet nature of the film. The disc is packed with extras, as it’s filled out with a music video, a making-of documentary, trailers, a photo gallery, cast & crew bios, and two audio commentaries. One features McConnell and co-producer Kevin Hutchinson, while the other has Fantasia going it alone. 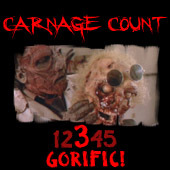 As an even further bonus, you can download the original score and screenplay through some DVD-ROM features. It’s a solid release for a film that’s best described as momentarily clever, and, while its twist is intriguing, it won’t exactly compel you to re-visit the film to see what you might have missed. Rent it!